Ramen, a Japanese term meaning noodle soup. 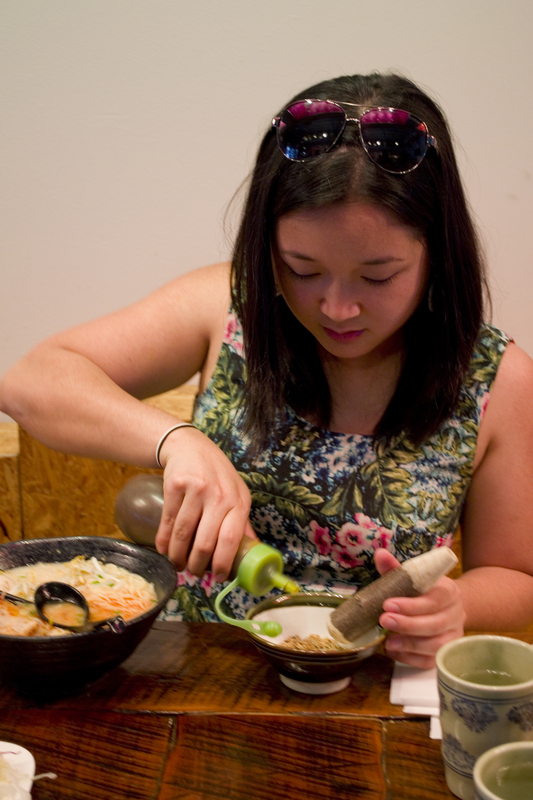 It is commonly made in a broth that has been infused with miso or soy, topped with proteins such as eggs, tofu or pork. The noodles are made with flour, salt, and kansui, a type of alkaline mineral water. The kansui gives the ramen its identity, turning the noodles creamy yellow and gives it that distinctive taste from the mineral in the water. 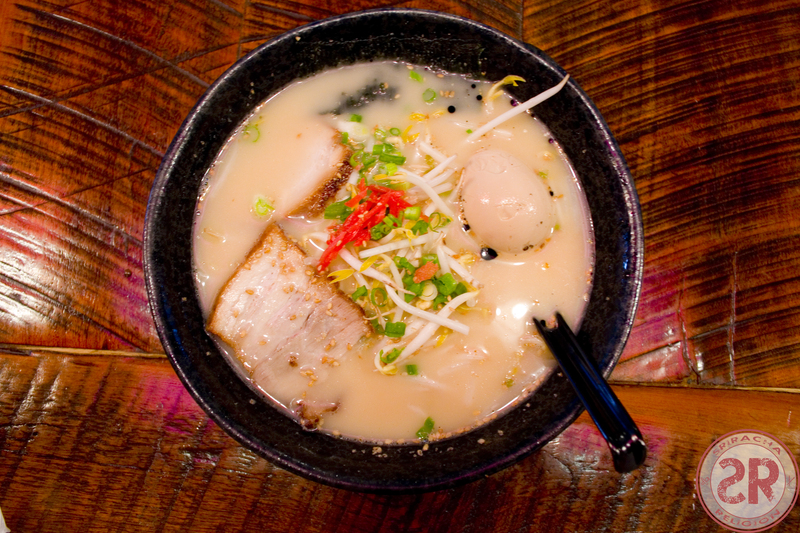 Tonkotsu is a version of ramen describing its pork bone broth. This is not your typical ramen noodles that are often associated with the college student life. This is a new foodie trend that has demanded America’s attention and captured its heart in the past few years. While Atlanta still plays catch up in the foodie scenes, we do have a few ramen noodle places to mention. 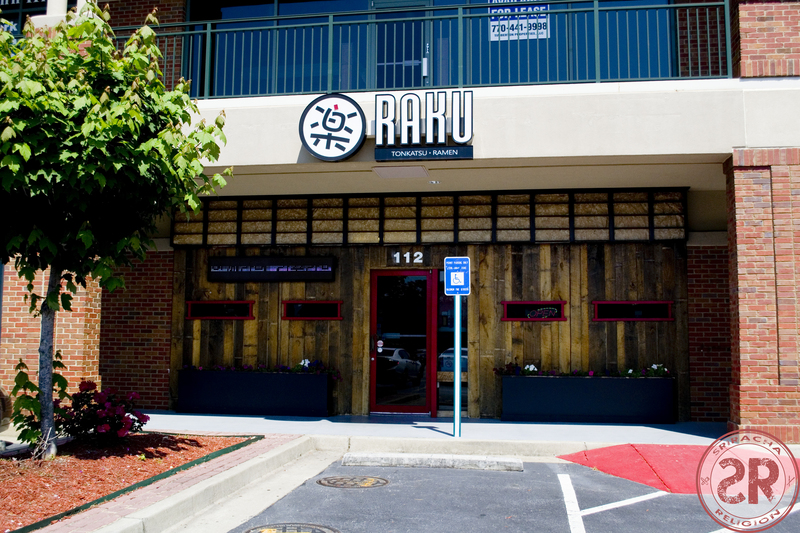 Sandwiched between multiple Korean shops and eateries of H-Mart Shopping Center in Pleasant Hill, Duluth, is Raku Tonkatsu & Ramen. Its red frames and wooden front are reminiscent of a casual Japanese establishment. 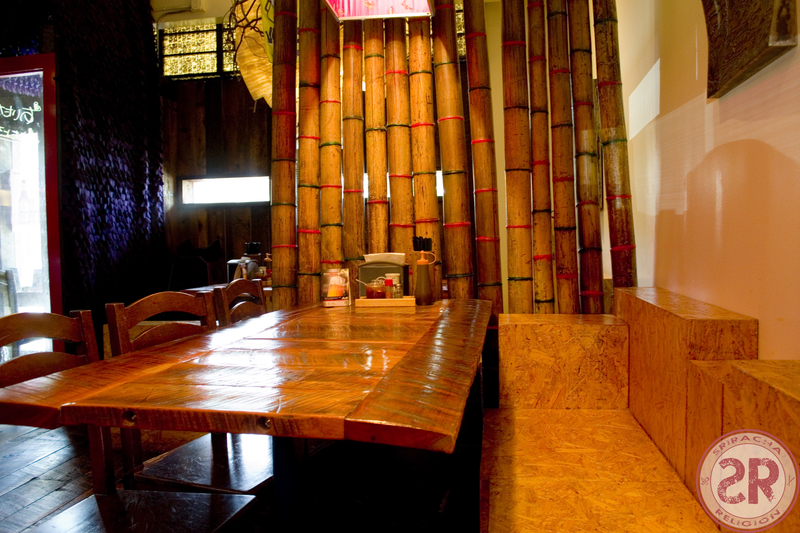 Inside, the decor is a balance of new industrial design and old, traditional, Asian touches of bamboos and arts. A few rows of rustic wooden tables lined parallel to its wooden, roughly polished booths. 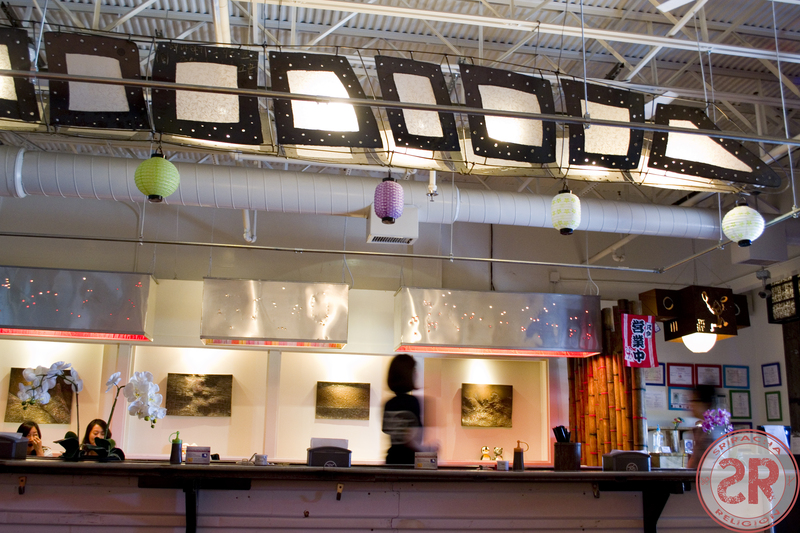 A tall, long community table sits in the middle of the room, steel lightnings beam above it. Each table is decorated with a selection of condiments and a bamboo vase of chopsticks, just like most street vendors in Asia. I met my friend, Yoshiko Santoso, at Raku for lunch. It was her idea to meet here, as she is a frequent diner. We ordered the Tonkotsu Ramen, Takoyaki, and Fish Katsu. 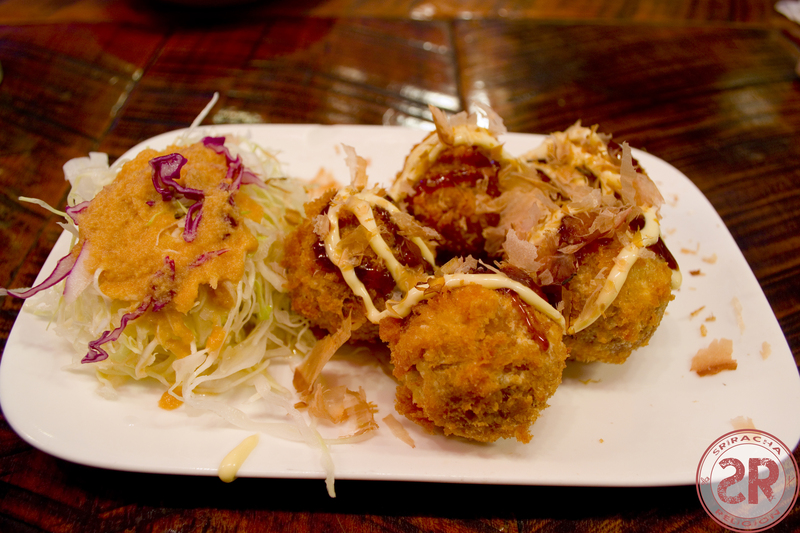 Takoyaki is octopus and vegetable batter fried into a round shape similar to a meatball, top with house mayo and a Japanese sauce that tastes similar to Worcestershire sauce. The outer layer is usually a little crispy, with a soft interior from the batter and the tenderness of the octopus. Combined with the sauce, these dumplings are divine. On to the entree, the Tonkotsu Ramen. The restaurant topped my noodles with 2 slices of pork, one soft-boiled egg, seaweeds, and bean sprouts. The noodles were delicious and fresh. It was probably the best that I’ve had in Atlanta. The bean sprouts give my dish a nice crunch and freshness. Unfortunately, the broth was extremely bland and diluted. I prefer my ramen dense with layers of flavors and textures. Raku’s broth was flat and plain. My egg has been overcooked and dry. In an attempt to save my broth, I incorporated the sauces and chili powders available to me at the table. Even so, the lack of excitement in this dish left me disappointed. Moving on to our second entrée, the fish katsu. This plate of lightly battered and fried fish restored my faith in Raku. The fish patties were not at all oily, they were perfectly seasoned, coated in panko and fried until crispy. The filet itself was juicy, melts-in-your-mouth delicious. The plate came with a side of tartar sauce. Being a regular at the restaurant, my friend asked our waiter to bring out the “grinding sauce.” I was surprised to be presented with a mortar and pestle. Inside were about 2 generous pinches of black and white toasted sesame seeds. Yoshiko advised me to grind the sesame and gradually add the katsu sauce from the selection of sauces at our table. The sauce is a little sweet and tart. The sesame seeds heightens its flavors. We dipped our fish in the sesame katsu sauce, then into the tartar sauce. The result was amazing. The creaminess of the tartar cools down the strong tart and sweetness from the katsu sauce, bringing our palates to a whirlwind of flavors. Needless to say, we did not leave a single crumb of fish on that plate. 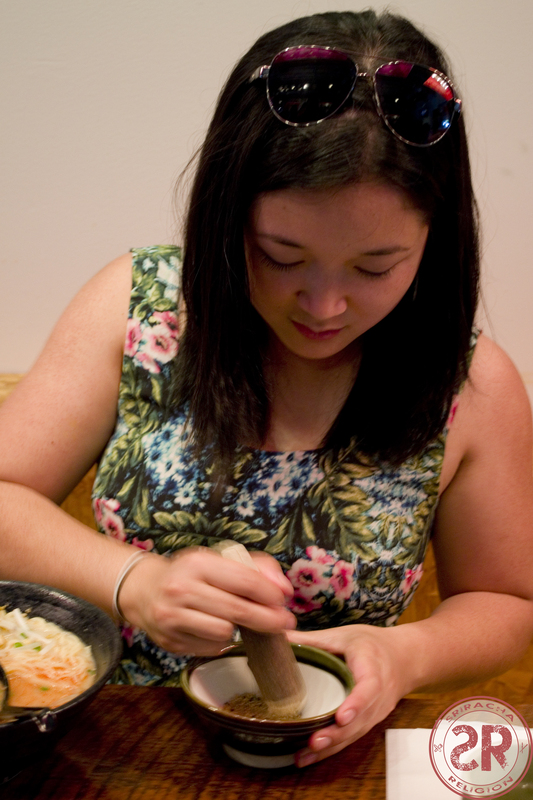 While the tonkotsu did not meet my expectations, I throughly enjoyed my other dishes. 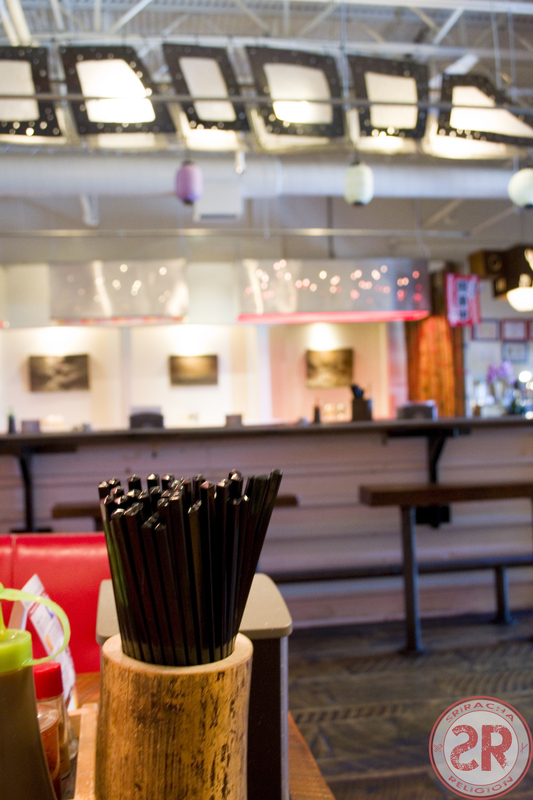 The large menu is an open invitation to come back for more. With friendly service and nice, clean, atmosphere, I will definitely return to see what else Raku Tonkatsu & Ramen has to offer. 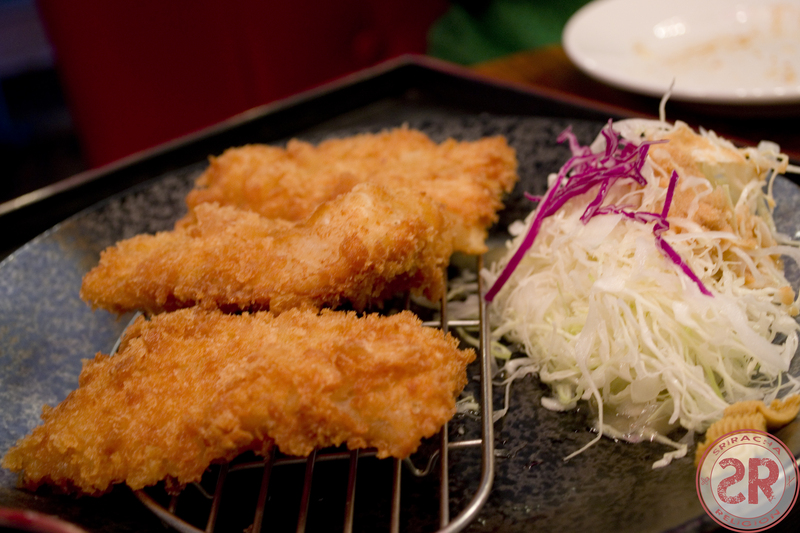 Yoshiko recommended the Cheese Katsu, which I cannot wait to try.